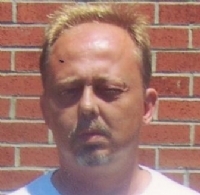 On or about 10-23-2008 Jeffery Lynn Combs was reported missing to the Wilkes County Sheriff’s Office. Jeffery lived with his mother, Lucy Combs, at 103 West Waugh Street in North Wilkesboro. Mrs. Combs reported to the Sheriff’s Office that she returned home from work to discover a note written by Jeffery saying, “my scooter was stolen and he was going to the bridge on Suncrest Orchard road to look for it, and to come look for him if he was not back by dark.” Officers searched the area of the bridge on Suncrest Orchard road and located the stolen scooter along with clothing belonging to Mr. Combs. Residents in the neighborhood confirmed seeing Jeffery in the area but his whereabouts are still unknown. If you or someone you know has information about Jeffery Lynn Combs, please contact Wilkes Crime Stoppers or the Wilkes County Sheriffs Department.